Normally I don't pay any attention to Estee Lauder's releases because they tend to be on the, uh, bland side, but while I was ordering my NARS polishes, this one caught my eye. 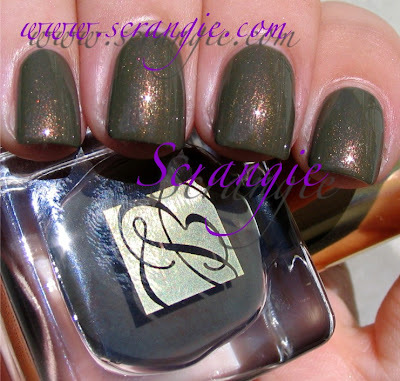 It's called Metallic Sage and it's a new shade for Fall 2011. Estee Lauder Metallic Sage. Sunlight, indoors, flash. This is a gorgeous green but strangely hard to capture. In real life it's light, grey-toned and very muted. In my pictures it looks dark and somewhat cleaner/less dusty. I'd call the shade something in between drab olive and khaki. Sage is a good name for it. Embedded within the greyed-sage base is a beautiful coppery shimmer with little flecks of gold. It's a subtle shimmer, very small particles, very smooth looking. I absolutely adore this. I owned a total of three Estee Lauder polishes before this, but now all of a sudden I'm really interested in seeing what else they have to offer. Have I been missing out? The formula is my least favorite part. It's thin and a little runny. It's sheer. I did three coats and it needed all three. It would even benefit from a fourth. The brush is quite strange as well- it's short, very soft and very square/blunt on the edge. Not the best brush I've ever used. The bottle is beautiful. It's a very heavy glass cube with the Estee Lauder monogram printed in gold on the front. Inside the cube, the polish is suspended within a circular chamber. I can't say I dig the tacky gold handle, but this bottle design is really different from all the other bottles in my stash so it stands out. Really shocked by how great this color is. It's perfect. Oh the dilemma of lemmings... Do I love it, or do I not like it?? I think sadly the answer may be - I love it but I am pretending I don't need it!!! I have always loved Estee Lauder's polish bottle-so unique-I think more time should be spent making prettier nail polish bottles! I love this color-may have to get it! Surreal Violet was a similar level of OMG awesome. They've started doing some interesting things once they started working with Tom Pecheux. I really like it! However, the last Estee Lauder shade I bought literally only lasts a day and a half on my nails, which is really disappointing for how expensive the polishes are. So I'll just admire from afar. Great post though! I also don't usually pay attention to Estee Lauder polishes. And I'm right with you there - my camera doesn't seem to accurately pick up khaki-type greens. Your swatch photos looks amazing, as usual. :) I love how you always seem to bring polishes to my attention that I may have overlooked. And by looks, I meant look. ARGH! There are probably other typos. I am way too trigger-happy. I love this color, I never really pay attention to their polishes either, But this color is different! I don't usually pay attention to Estee Lauder either but several items from the Modern Mercury collection have really grabbed my attention. This will be mine! I'm always tempted to pick one up. This might be the one! Great photos! Hi! I love your swatches. It may be my screen, but the color of Modern Mercury looks very similar to my bottle of Diamond Cosmetics Never so Evergreen which is also an olive green with gold shimmer. How do they compare? I only own one Estee Lauder polish, Surreal Violet. I believe I need this one! I've never even thought about Estee Lauder polish, never see it on the blogs! This color is a beauty though. I saw another pix of this shade before now and major love it....but we have zero places to get EL product for over 200 miles now that so many of the dept stores closed and pulled out of smaller areas. Funny that EL comes out with good colors now as they used to only have mom shades and really safe colors - now moms' are a lot more hip. Even some of the TV selling hosts are sporting something other than a French mani - same for Ladies of the View too I have noticed! Color polish has arrived. It reminds me a little of an ancient Orly I have -- Cool as a Cucumber, and a little of another ancient one, Lancome Elfe, that I used to have years ago. Definitely have to grab it because I love EL's square little bottles. I have a few of their LE holiday colors from seasons past. I wonder how similar this is to Zoya Yara? Holy moly - I want dis bayyyddd. How on Earth did I miss this!!!!!!! Defn checking this out when it arrives in Oz. EL used to be incredibly bland - in the last year I have found myself buying some amazing lipsticks (spring collection particularly) and polishes. Had to actually pinch myself when buying green and blue polishes that were Estee Lauder!!! Tom Pecheux is certainly taking them to a new level. Beautiful! I love your swatches! I too did 3 coats with Metallic Sage and could have really done with a 4th - v thin and runny polish. Was starting to worry that I had a dud bottle as every other blog review of this that I have read has stated that this was a perfect 2 coater and easy to work with! Odd eh! ?